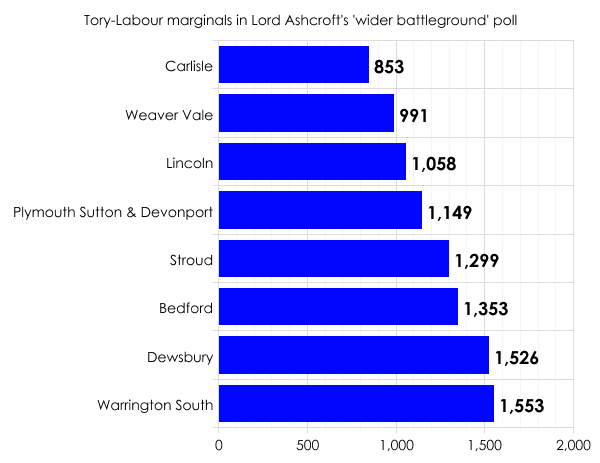 Labour will take heart from Lord Ashcroft’s latest survey of marginal seats. This time he’s sampled opinion in what he calls the “wider battleground” – constituencies not right at the top of Labour’s target list, where gains are pretty much guaranteed, but those a bit further down. These are seats which could mean the difference between a hung parliament where Labour is the biggest party, or one in which the Tories could once again try and form a coalition with the Liberal Democrats. In the eight Labour targets he polled, Ashcroft found an average swing from Conservative to Labour of 6.5%. This would be enough for Labour to gain all of the eight in question: Carlisle, Weaver Vale, Lincoln, Plymouth Sutton & Devonport, Stroud, Bedford, Dewsbury and Warrington South. That last seat on the list, Warrington South, currently held by David Mowat, would fall to Labour on a swing as low as 1.4%. Gaining each and every Tory target up to and including Warrington South would increase Labour’s total number of seats by only 21: a rise from 258 to 279. Add in a dozen or so gains from the Lib Dems and you’re still under 300: nowhere near enough to be comfortable of forming the next government, either as a majority or minority administration. In short, Labour seems to be doing well where it ought to do well. The real test is whether it can do well where it needs to do well. Nonetheless it’s useful to see the current state of play in these sorts of constituencies, not least because the suggested size of swing is well above that needed for the seats to change hands. There’s a temptation to get greedy when presented with these kinds of polls, the scope of which we’ve never been lucky to have before. You end up wanting to see more data, and this time even further down Labour’s target list, to seats like Cannock Chase (Tory majority: 3,195), Stevenage (3,578) and Loughborough (3,744), the sort the party needs to win if it wants to form the next government. Maybe we will see polls in these places. There’s still eight and a half months to go and Lord Ashcroft shows no sign of slowing up with his surveys. Ashcroft also sampled opinion in four Labour marginals that are Tory targets. He found a swing to Labour in three of the seats: Birmingham Edgbaston, Bolton West and Hampstead & Kilburn. But in Southampton Itchen there was 0.5% swing away from Labour to the Conservatives, with both parties tied on 34%. Ashcroft suggests this might be to do with the seat’s high number of students currently being away for the summer. London still dislikes Ukip. The party polled only 2% in Glenda Jackson’s seat of Hampstead & Kilburn. Ukip did better in shire towns and suburbs. It polled 21% in Bolton West and Plymouth Sutton & Devonport. The Tories are faring particularly badly at Ukip’s hands in Bedford. Labour’s share is up only two points, but the Tories are down 11 and Ukip is up 12. Unsurprisingly, the Liberal Democrats are being squeezed in these seats almost to extinction. In Birmingham Edgbaston they polled only 3%. And there’s more glum news for Nick Clegg: those who voted Liberal Democrat in 2010 are currently more likely to say they would vote Labour at the next election (32%) than that they would stay with the party (27%). Around one in eight 2010 Lib Dems (12%) also said they would switch to Ukip. If neither Labour nor the Conservatives achieve a majority, who is likely to get the most seats? Given that the governing party’s vote tends to improve as a general election approaches, it really is too close to call. And will either have a enough seats to form a minority government? Even if he comes second, Cameron will be the sitting Prime Minister so could have the first go at forming a government. Cameron will definitely try to stay in power if at all possible – which is his right, as sitting PM. But my feeling at the moment is that the Tories won’t end up the largest party in terms of seats, so his case for remaining in office will have to be based either a) on getting the most number of votes or b) concocting a coalition that would be more stable and last longer than one between Labour and the Lib Dems.